To embed custom CSS styles and scripts in WordPress you should use the wp_enqueue_script(), wp_enqueue_style(), wp_register_script() and/or wp_register_style() functions. Each of these functions allows you to define a version. By default it's the version of WordPress. The version identifier will be in the URL to the script as a query string. The version identifier is used to expire the URL. Since the browser detects the new URL as a new resource, it will use the new instead of the cached resource. Most proxies, most notably Squid up through version 3.0, do not cache resources with a "?" in their URL even if a Cache-control: public header is present in the response. To enable proxy caching for these resources, remove query strings from references to static resources, and instead encode the parameters into the file names themselves. So the goal is to encode the version identifier into the filename without renaming the resource on the filesystem. This is where the following plugin comes in. Fonts have become great favorites of the customers, with relatively little effort you can achieve a lot - at least if you understand some of the typography and use solutions that are easy to implement. In this context, I had experiences with own fonts from designers and the costs are not in proportion to the use of free web fonts. In particular, Google provides here a big range of solutions and makes the integration easy. The endless choices of fonts also presents a problem, it is not easy to find the right fonts in a good combination. In the past I collected some solutions in a single page and now have a very nice scope. The solutions are not from me, but usually by designers in the world wide web. 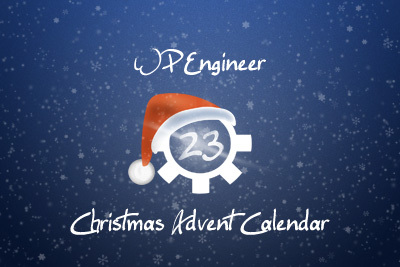 In this little tutorial we show how to add in the navigation of the TwentyEleven Theme our RSS Feed, a link with icons to our Twitter page and to our Facebook profile. Without writing a single line of PHP code. You are able to accomplish this with the WordPress Menu. First we go in the backend to Design-> Menu and activate the CSS Classes. Therefore we click on "Screen Options" on the very top right corner. And unter "Show advanced menu properties" you check the box for "CSS Classes" and close the Screen Options. After that we use the "Custom Links" to create the menu entries. 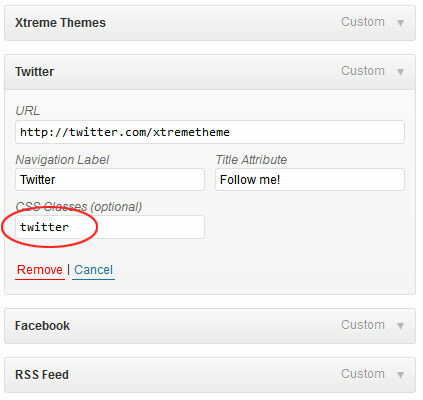 We add the addresses to our RSS Feed, Facebook and Twitter and add them to the menu. There we assign the 3 menu entries to the CSS Classes. RSS Feed has the class rss, Twitter the class twitter and Facebook facebook. Don't forget to save. I prepared a sprite, which you can download with a right mouse click->Save Image As… . You have to save this sprite into the folder twentyeleven/images/. Then we open the file TwentyEleven style.css with a text editor and add at the end of the Menu block #access our additional CSS. We do not have much to add. We let our 3 list items float to the right, push the text out of view and position the graphic. Only for the hover, focus and active states, we must define a little tricky CSS rule in order to circumvent the background gradients of TwentyEleven. This is just an example to experiment. Add your Google+ profile and expand this example with cool CSS tricks! Today I would like to show you, how to assign CSS classes to custom post types for styling your website. Not everybody likes the WordPress Admin Bar, which exists since WordPress 3.1, at the top of the browser. With just a bit CSS you can change it. The following function provides CSS directly in the footer of backend and frontend. It displays the Admin Bar at the bottom. CSS Media Queries are getting more popular and the adjustment of the size of a website for different clients or the size of the browsers are more necessary. The Media Queries are a solution, which also have its advantages and disadvantages. It was a disadvantage, when using, that I couldn't see all sizes at the same time. So why not just a small script, the iframe element. If you like to use it, here is a simple solution or you can use the current script in my "Test-Laboratory".